Allen and Karen live in Gibsonburg, OH on what was originally Allen’s parent’s 110 acre dairy farm. They have been married 55 years and have a son Scott & Leanne and a daughter Bonnie & Jim and three granddaughters. Everyone lives on the farm which now has three homes. Scott also owns the farm next door. Scott helps with the farming and Jim does the restoration work. 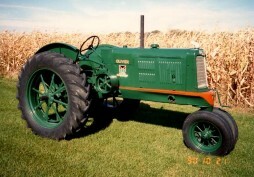 Allen was born and raised on Oliver tractors and still farms with them. Karen is a big part of the farming. Her favorite job is running the combine. The favorite memory and story involving their collection is Karen’s 550. 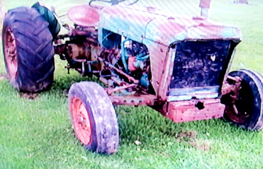 As the story goes this tractor was purchased as a parts tractor – brown and the wheels locked up. As Allen and Jim got it broke free and soon it was running Karen became excited that it was going to be more than just more parts on the shelf. Karen thought it looked nice enough it should be sold. As Jim finished the restoration the holidays were coming so Allen had a decal made the said “Karen’s” and placed it just above the 550 decal then gave it to her for Christmas. Now she could not sell it; “it would be rude to sell a Christmas present”. This story was published in the Hart-Parr Oliver magazine March/April 2011. Allen says one of his favorite things about being a Buckeye Oliver Collector is meeting other Oliver collectors. Martha and I live in McCutchenville, OH where I am retired but always busy with some job every day, especially working on my Oliver tractors and equipment. My son Dan and grandson Zachery help with my collection and Dan has several pieces of his own. 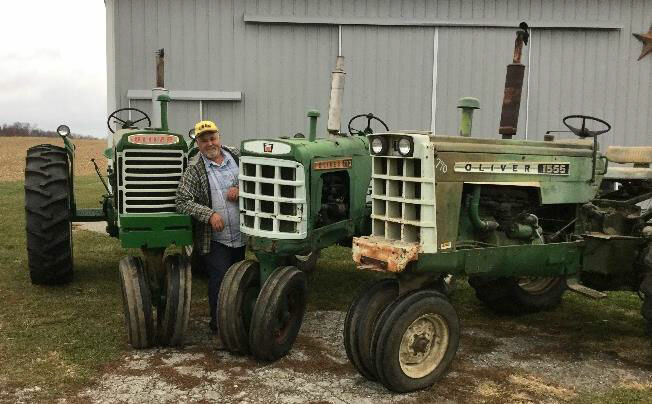 Growing up and farming with Oliver equipment made it just a matter of time before my collection started. My collection got started in 1996 with an Oliver 60 when I turned 60. My latest addition is a No. 2 potato digger. My favorite implement is the 7 foot Oliver double cultipacker with a seat. I used to ride one like this being pulled by horses. My favorite memory is on a Thanksgiving Day when 3 of my sons and 3 of my grandsons plowed with a walking plow on our farm. My 4 year old great grandson walked along side with his hand on the plow beam and a big smile on his face. Family involvement is very important to me. All are restored but the 18-27. I also have 8 Oliver walking plows and several sulky plows, 20+ Oliver tractor plows from 1 to six bottom, Oliver disc plow. Most of the plows are restored. No. 17 manure spreader, double cultipacker, No. 22B hay conditioner, No. 2 hay rake, No. 520 baler, 3 horse drawn mowers, No. 55 2 row potato planter and a No. 2 potato digger. I have purchased most of these pieces from auctions, ads and the internet. 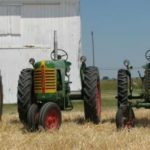 Whether within the Buckeye Oliver Collectors or anywhere in the Oliver Hart Parr Collectors group I most enjoy the ability to talk with friendly and like-minded people who care about sharing this country’s great agricultural history. A retired public high school teacher living in Auglaize County, Wapakoneta, OH. Reading this profile you will see the impact of Dad’s tractors as four of the five tractors that I own were my fathers. This is where the collection starts. 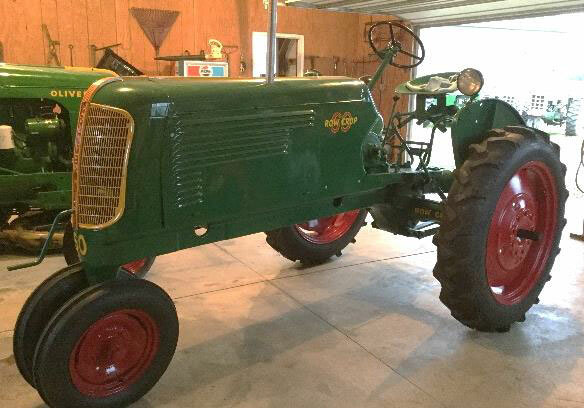 My first tractor was a 1936 Oliver Hart Parr 70, a 1941 Oliver row crop 60 with 36” rear wheels, a 1949 Oliver 77 narrow front, a 1953 Oliver 77 wide front, and my last purchase was a 1966 Oliver 1850 diesel. When I was farming my 80 acres the 77 wide front was used to plant, drill, spray, pull a haybine, rake hay, mow, apply fertilizer, bale hay, haul grain and many other tasks. 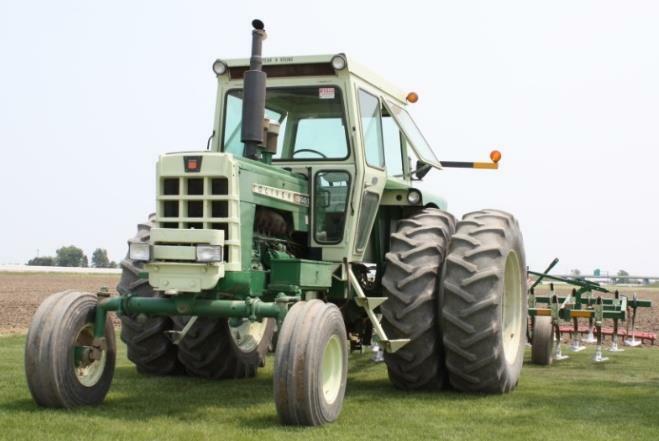 One of my fondest memories is taking the Oliver Hart Parr 70 to the tractor pulls in the 1980’s and 90’s and out pulling other tractors. The best part of being a BOC is getting to talk tractors and learning. I believe our family’s love of Oliver’s started in 1956 when my Dad, Bob, bought a late model fleetline Oliver 77 diesel from A.J. Boellner in Maumee. He also bought a new Oliver 3 bottom hydraulic lift plow and a new 22B mowing machine that we still have and use to mow wheat stubble. This was in the days of pull type equipment so the 77D got used for all heavy tillage work, running the pull type combine, corn picker, baler, manure spreader, etc. Our MM model ZA was the loader tractor and did some finish tillage as I got old enough. 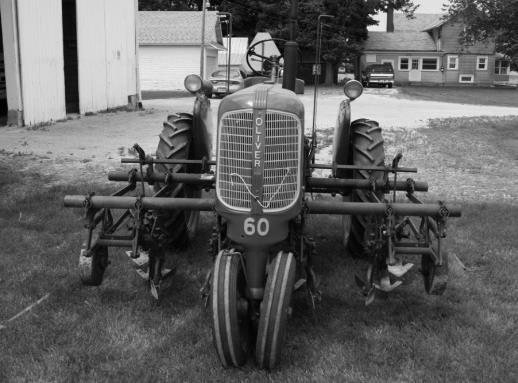 In the summer of 1959 Dad bought a used Oliver 60 with a 2 row mechanical lift cultivator. This is where I learned to cultivate. In 1961 Dad bought a used Oliver 64 grain drill which we still use occasionally. He also traded the MM ZA and loader for a MM 445 and loader. Then came another Oliver plow so we could plow with 2 tractors. We still have the MM 445 as our loader tractor. In 1965 after renting more ground, Dad found a real nice Oliver 88 diesel standard tractor for a very reasonable price and then a 4340 plow to go along with it. He kept the 88 for about 10 years then sold it for what he paid for it and never spent much on any repairs. 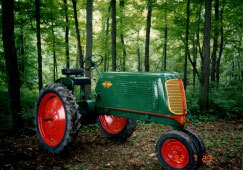 What a sweet running tractor it was, wish we still had that one! Penta County JVS was to open in the fall of 1965, my senior year of high school and I wanted to enroll in agri-mechanics. Wishy Boellner brought one of our tractors back from the shop and Dad asked him if they could use some summer help so I had my first job off the farm. I worked summers and vacations also during my 4 years at Ohio State. Over this time Dad bought a used Oliver 241 disk which we still use ahead of drilling wheat in the fall and a new 245 field cultivator. Then in 1969 he bought a new Oliver 1650 diesel with a set back front end and a new 565 4 bottom plow. 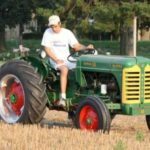 How we learned to love that tractor, still one of our favorites. It is plumbed up to run our 5100 White 6 row planter. We still have the plow but it has been sitting in the shed a number of years. In 1970 I graduated from Ohio State and started teaching agri-diesel mechanics at EHOVE JVS in Milan, OH. I was there 6 years but my wife and I both wanted to get back “home” so I started back with A.J. Boellner in August 1976, and have been there ever since. Forty years of working on Olivers and Whites although we are now a New Holland and Grasshopper dealer as our main lines. It was great to be back on the farm. We had a house built on the south side of the Ohio turnpike on the back corner of the farm. It felt good to be back helping Dad in the fields and he also worked part-time over winter at Boellner’s. The fall on 1979 a neighbor passed away and his wife wanted us to farm her place so we went tractor shopping. Boellner’s had a 1950T traded in that had a rod come through the block so we had installed a new short block, went through the hydra-power, etc. 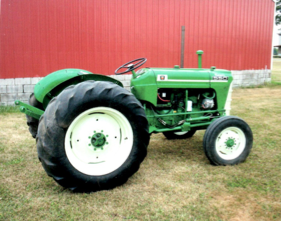 After looking at other tractors Dad said he wanted that 1950T but with a cab. So after getting the tractor home and repainted we installed a new year round cab. What an addition to the family! 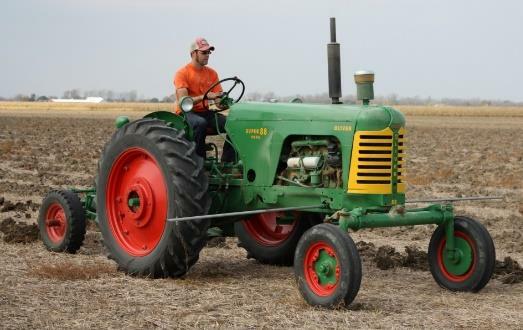 Dad sure enjoyed plowing with the 4-14s and fitting ground with plenty of power to spare. The spring of 1981 Dad had heart bypass surgery but died the end of July. What do I do now? The farm was not big enough to support my Mom, sister and my family. I would have to keep my job at Boellner’s. My neighbor lady wanted me to keep farming her place so with 22 acres of our farm by our house, I would still do that much and rented the rest to a good neighbor friend we knew would take good care of the land for us. over to one side, then drive in the tracks from last years corn, circle on the far end and drive back in the same tracks. This puts a row of beans on each side of the old corn row. It takes time but it works. With 3 sons growing up they also caught “Oliver Fever”. Our oldest son Mike, parts man for A.J. 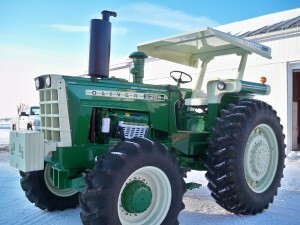 Boellner bought a Super 77 gas tractor to work with. It does a decent job pulling our Oliver #12 1 tooth subsoiler. Then he bought a nice original Oliver 66 gas with a wide front which I now use on our sprayer. With the wide front and skinny tires I can sneak down between our 15” bean rows, that put our little 60 into retirement. Our youngest son Andy, who works in the Wood County Engineers office, went to an auction in June 2010 and came home the proud owner of an Oliver 1900 C series with FWA. It needed clutch work, one front axle shaft, transmission and rear end work but now does a good job with our 3 point chisel plow. Our middle son Ken, made a major career change in 2007 and when he graduated from seminary in 2011 I had bought him a Super 55 as a gift. He and his wife are both ministers and serve 2 churches in Michigan. He enjoys mowing wheat stubble with the Oliver 351 mower my neighbor lady had given me. I also revamped a 3 point sprayer for spraying along both sides of the turnpike and road sides. Our neighbor has retired from farming so we now farm all of the home place and the rented farm. With 2 sons close by we all work together and do enjoy using our Olivers. Our 2 latest additions are a White 5100 4 row planter with a 3 row 6900 splitter we use for beans and a 1750 diesel with a setback wide front end. The tractor we spent the most years refurbishing was a Super 88 diesel wide front with a hydra hitch. It was traded in with a dropped valve on No. 6 cylinder. We found a good used head, installed all new pistons, sleeves, rings, bearings rebuilt the hydraulic pump, etc. Repainted and new decals and now use it to pull a 241 disk and cultipacker ahead of drilling wheat in the fall. Then it is time to get the 77D hooked to our drill and have more fun. With 10 Olivers, a MM 445, and a Silver King that was my uncle’s, we have a lot to keep us busy but also a lot of enjoyment. 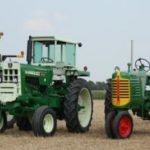 Over the last 40 years we have seen a lot of changes in farm equipment. During my first summers and vacation time working for A.J. Boellner in Maumee we did a lot of repairs on 66, 77, 88, 3 digits, and occasionally 1600 or 1800 tractors. This would have been 1965-1970 era. 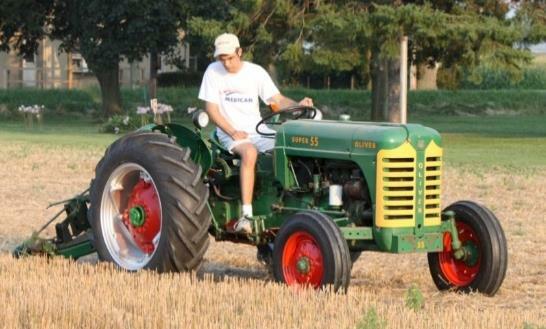 When the 50 series tractors came out they would practically sell themselves. 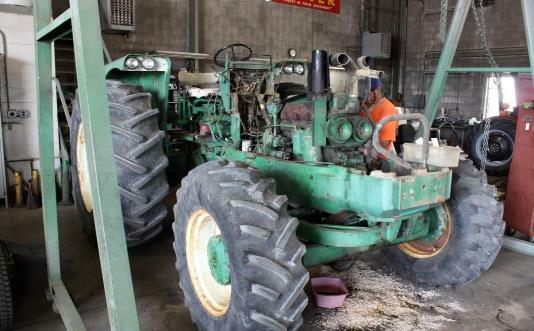 Big heavy frames, smooth running 6 cylinder engines, full power steering, tilt, telescoping steering wheel, comfortable Bostrom seats, hydra power drive (later over-under 3 speeds), built in 3 point hitch, independent PTO, live hydraulics, etc. A pleasure to drive and how many are still being used to this day, they were built to last! And then plows; I think we sold plows behind every brand of tractor made, no one could compete with an Oliver plow. too much. If you own a 310 Waukesha please set the high idle back to 2500 RPM, it won’t affect horsepower, and don’t lug it below PTO speed especially if turbocharged. Then with the switch to closed center hydraulics there were some leakage problems but a lot of these were changed when the gray tractors came out. The Oliver Corp. was very supportive of their dealers. The sales reps and service people that came to the dealerships were very helpful; service schools were always very informative, hands on experiences and parts support was top notch. Their parts books were like actual pictures of the breakdown of each component or system and their shop manuals gave great step by step teardown and reassembly instructions for each procedure. I was to the Columbus branch a few times and everyone was so friendly. I made one trip with Larry to Charles City to pick up 3 tractors one fall. We got there after the plant was shutdown for the day but they took us down through the assembly line where they were building red Cockshutts and green Olivers. Then in the back lot one side was red tractors, the other side was green. 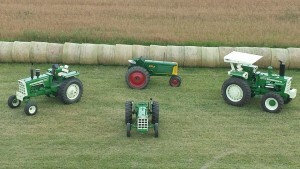 We got 3 green ones, 2 1850’s and a 1750. 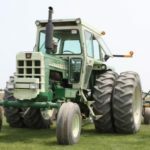 In 1976 when I returned to Boellner’s the gray tractors were being sold, the 2-135 and 2-155’s had just came out. 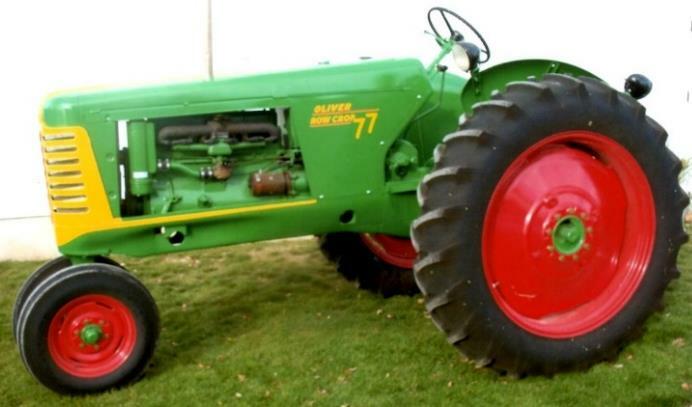 What a tractor these were! Big, heavy, powerful, comfortable, with a good lugging long stroke engine, a solid rugged transmission differential and final drives. The 2-85 and 2-105 were back to Perkins engines, upgraded closed center hydraulics and proven drive trains. Some early 2-135, 2-155’s had piston ring and ring land problems and head gasket seepage problems. A few update items here and there but still a good line of hard working tractors, many still out in the fields today. 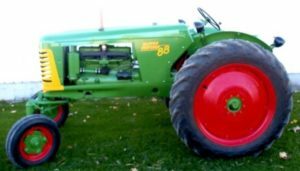 In fact the same drive train with some modifications was used in the 4-210 and 4-225 4 wheelers and through the work horse series of tractors. Along comes the White 5100 planter line! What a simple but accurate planter idea. 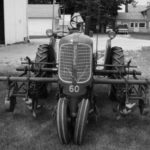 For some years we rented 2 – 6 row planters and splitters set up for no-till with 1950T tractors through Lucas & Wood Co. soil & water districts to start farmers looking at no-till planting equipment. This helped us sell a lot of planters even into the 6100 series. We also rented White disc chisels for fall conservation tillage. Looking back I must say I met a lot of nice people over my years working at Boellner’s and I have worked with some very fine people, you almost become like family. I started working with Wishy and his brothers Tony and Eddie and son Lawrence (Larry) and now his son Dave and daughter Kris. Three generations and they still keep me around! 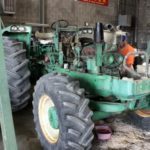 We still have a lot of customers running their Oliver and White tractors and equipment and sell a lot of parts, even out of state. 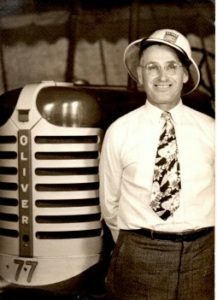 Probably one of only a few people who were originally Oliver dealers. If you are ever in Maumee stop by, Larry likes to show people his 10 restored Olivers. Only thing now for new equipment you will see blue New Holland tractors and Grasshopper mowers. Jim Brown is a Buckeye Oliver Collector member and lives in the Croton – Johnstown area with his wife Vicky. They have two sons and a grandson. Jim cares for his late parent’s farm of 144 acres which has been in the family for 100 years; he is the 4th generation. 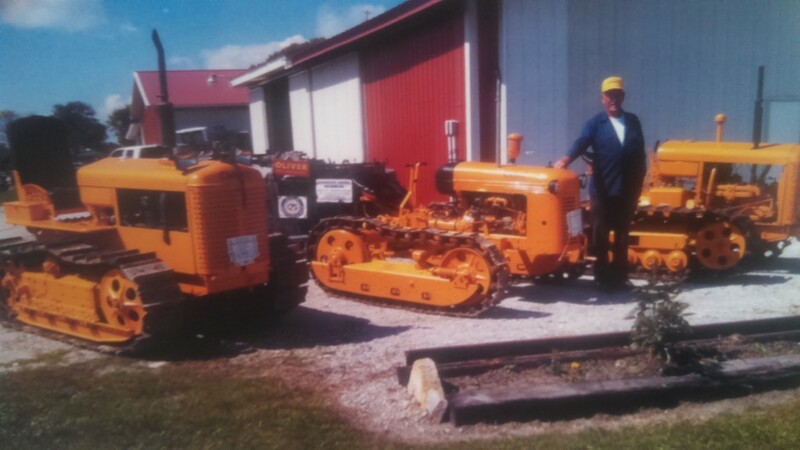 Jim has had Oliver tractors most of his 59 years with the exception of one orange one. Jim grew up with a WD45 that his dad owned. Jim says “If you ever worked ground with one of those you can really appreciate an Oliver”. 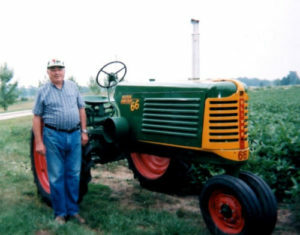 Jim’s grand-dad had an Oliver 66 which he bought new in Newark, OH and did most of the farming with. Grand-dad also had a 60 and a 70 and a lot of implements. Grand-dad gave Jim the 66 when he was 14 years old. Two years later Jim traded it for a Super 88 with a wide front end and power steering. It was a great tractor and wishes he had it back. 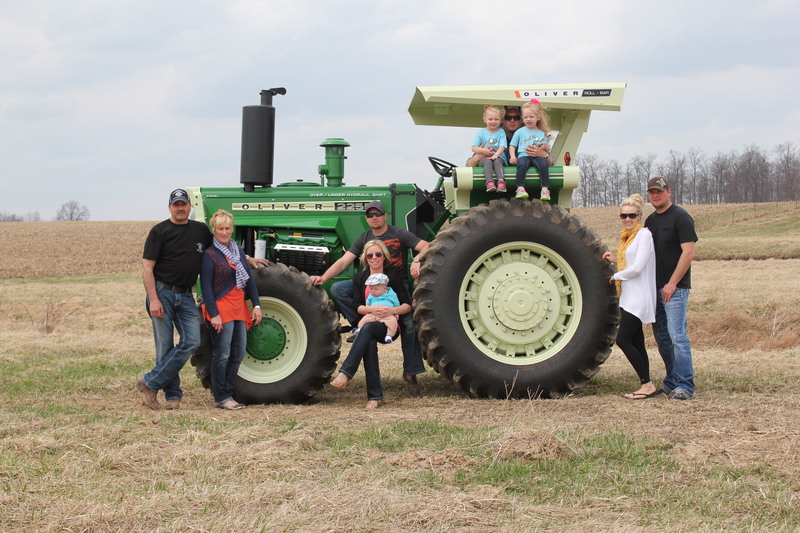 Jim’s dad bought a 770 and a 1655 from Ohio Foundation Seeds to upgrade their equipment line and improve their farming operation. How times and the farm have changed. Jim works full time in town. He uses an 1855 with a 15’ bush hog to keep the farm looking nice. There are a lot more tillable acres, a lot less pasture today. 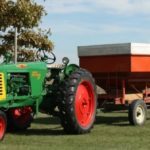 “I always liked going to Shady Knoll Farm Service in Croton to look at the Oliver equipment and talk to Wilmer Prushing who is the owner and a lifelong friend” say Jim. He also liked visiting Straits Farm Equipment to see what used equipment was there. Jim has mostly John Deere implements all pulled by Oliver tractors. People ask him why he does not have John Deere tractors he says “I need something reliable”. 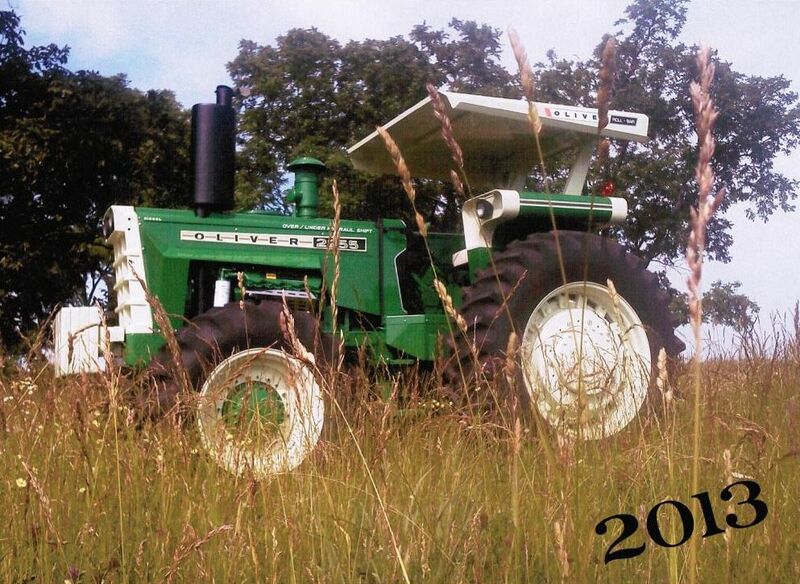 His current tractor line up is 1855, 1555, 1600, 880, 3 – 770’s, a Super 66 and a 60 that was just restored. His favorite is the 880 which was the first one he restored. It has a power booster and power steering. Jim has owned more than 15 Oliver’s and loves to collect; he rarely sells. Thanks Jim for a great story and keeping the tradition alive. Lee grew up in Fairfield, Iowa where he worked at his family’s Oliver dealership which opened in 1946. Lee assembled machinery and did some mechanical work, mostly on the 70’s. While in college at Iowa State he worked at the Charles City factory Engineering Department. In the summer of 1952 he operated the test stand to “run in” the two Oliver 77 propane tractors that were later sent to Nebraska for formal testing at the Nebraska Testing facility. In 1955 Lee started wearing an U.S. Air Force uniform were he became an Air Force pilot and engineer. 26 years later he retired with the grade of Colonel. Lee become a charter member (#329) of the HPOCA and served six years as secretary on the HPOCA board. He was the first president of the Buckeye Oliver Collectors holding this position for 10 years. He was then secretary until our fall banquet in November, 2016. Lee has not missed a HPOCA summer show or winter get together in 20 years! In 1946 when delivering a new 60 row crop to a farmer in Iowa he had good fortune of meeting the farmer’s wife and daughter. Seven years later he married the daughter! 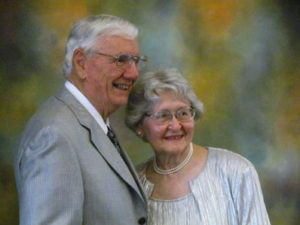 This year Lee and Shirley celebrated 63 years together! It’s not hard to see the passions Lee has had throughout his life; Oliver tractors, Air Force, and family. Lee and Shirley volunteer at the Air Force Museum and get to come for the first time in many years to an Oliver event and just visit. People of all ages love their stories. 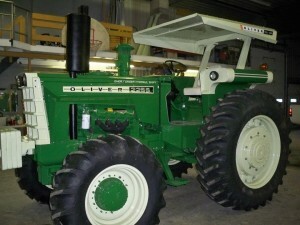 Only owning one Oliver tractor, a 77 standard, Lee has shown that there are many ways to be dedicated to the Oliver world. The next time any of you see Lee and Shirley be sure to stop and say Thank You for all they have done. Wayne and Mary Groweg are Buckeye Oliver Collector and HPOCA members. They live on Wayne’s family farm near Gibsonburg, Ohio. They are the 5th generation living on this 120 acre farm which has been in the family since 1883. This farm is registered with the State of Ohio as a century farm. Wayne has lived on this farm his entire life and been farming it since his dad passed away when he was a junior in high school. Wayne and Mary have been married 48 years with three sons; Bob, John, and Dan, and five grandchildren. The boys help with the farming along with their own farms. Wayne has 10 Oliver tractors and many one and two bottom plows and other implements. His 77 is a tractor that his dad bought new in 1949. The 88 is a 1952 his dad bought in 1954. These two are his favorites. Also in his collection are a Super 44, 550, 99, 1600, 1800, 1855, and a 2-105. All are used on the farm, some more than others. This past September Wayne and Mary were honored to have a 9/11 Memorial painted on their century old barn. Scott Hagan (AKA the Barn Artist) did a superb job with this mural. 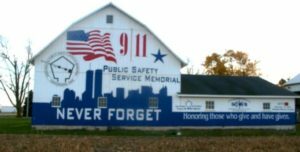 The barn has been bringing folks from near and far to see this touching tribute to those who give and have given for our safety. Check out the video on facebook under “the Barn Artist” and click on videos to find it. This would be a great afternoon drive to see this beautiful tribute. Thanks Wayne and Mary for all you do, for your family, friends and community. 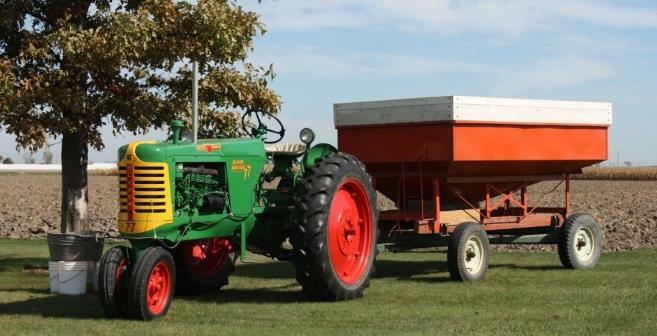 I have also included some pics of our tractors at the annual July/October Oakridge Festivals in Attica, Ohio. 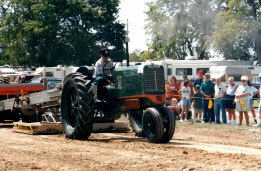 The show features tractor shows and pulls. Go to www.oakridgefestival.com for more information. At 75 years of age, I am a 5th generation and still enjoy actively farming a modest 200 acre grain farm in what historically was called the Northern Ohio Great Black Swamp land. 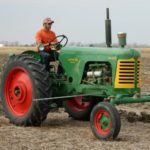 As farming changed from the horse to early heavy iron tractors, there was a need for a replacement to allow early season spring working of the soil without compaction. Crawler type tractors were very popular locally and our extended family farmed using six Cletracs during the 1930s thru the 1970s. 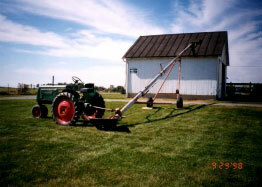 My Dad was the last in our family actively using Cletracs for muck-farming potatoes in the Homer, MI area. The family members would make their Cletracs available to my Dad for parts to keep ours working. When my Dad died in 1997, I found five Cletracs in various disrepair and brought them home to enjoy as four of them survived. Three are show tractors and #4 is a stationary flag pole in my front yard.